Today I have something rare on today’s post….some home decor!!! I rarely show my home on here but I thought it would be fun to share with you all some ways I am decorating in this transition period to fall. I am anxious and ready for fall to start especially with back to school happening…I want all the flannels, pumpkins, apple cider donuts…all the fun stuff that fall brings. BUT Its legit 90 degrees out today so probably not appropriate. So I am slowly transitioning my house into those fall vibes in a softer way around my home! 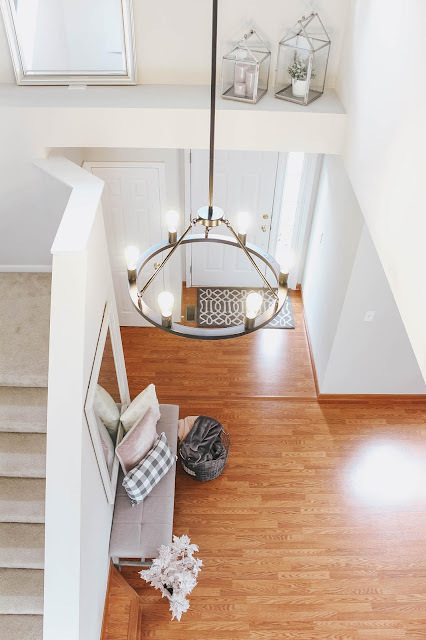 I also wanted to share with you our new foyer light!! This is from Linea Lighting. I absolutely LOVE the touch it brings to our home. It gives our house that industrial farmhouse feel that I lust after. I love how the black contrasts against all the white and gray we have in our home. Linea Di Liara Lighting has amazing fixtures for anywhere in your home. From pendants and chandeliers to sconces, they have so many options for your home. They also have a really helpful blog on designing your lighting to make it a perfect fit for your home!! Another exciting option is I have a discount code for you all!! This code will ONLY LAST for ONE WEEK ONLY! So make sure to head over and grab the light fixture you’ve been wanting for your home!!! Use code ‘YE5BFZKP’ at checkout! 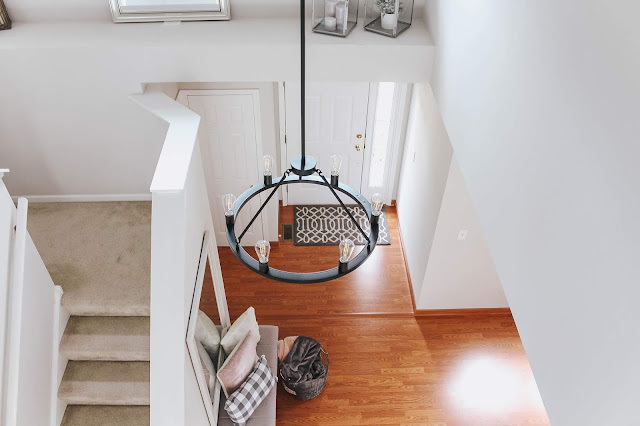 Let’s talk a little bit about my transitional home refresh….I have always been a fan of lighter and brighter in my house. After living in dark and dreary apartments in my younger days, I knew I wanted my home to be light and bright. I believe the light and bright concept really helps my mood and helps me be productive within the home. 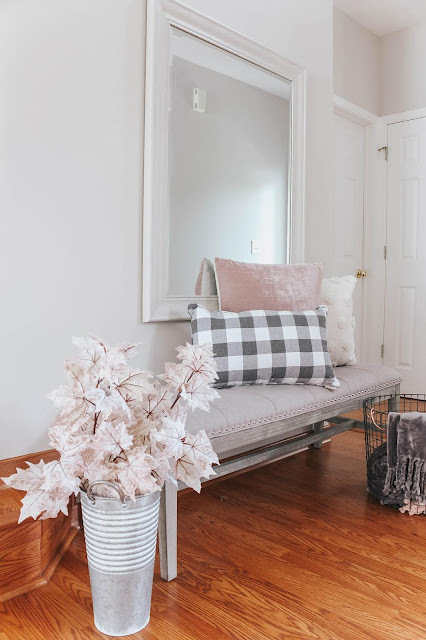 Therefore for my transition for fall, I kept things very light with pops of blush pink in there. I love these rosy-toned leaves with the galvanized vase. Hope you all have found a little inspiration! 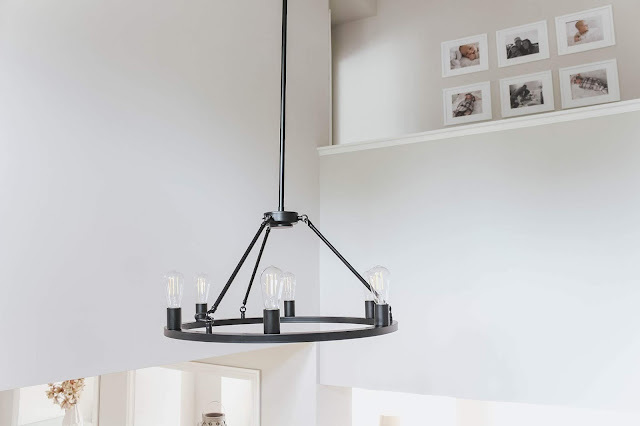 Make sure to check out Linea Lighting for your next light fixture!! Previous Post ABERCROMBIE PICKS AND SALE!